The fifty-sixth Parliament of the United Kingdom was the legislature of the United Kingdom following the 2015 general election of Members of Parliament (MPs) to the House of Commons. Parliament, which consists of the House of Lords and the elected House of Commons, was convened on 27 May 2015 at the Palace of Westminster by Queen Elizabeth II. It was dissolved just after midnight on 3 May 2017, being 25 working days ahead of the 2017 general election on 8 June 2017. The dissolution was originally scheduled for 2020, but took place almost three years early following a call for a snap election by Prime Minister Theresa May which received the necessary two-thirds majority in a 522 to 13 vote in the House of Commons on 19 April 2017. It was the shortest Parliament since 1974. This map shows by geography the colours each of the 650 constituencies of the 2015–17 Parliament. The election saw each of Parliament's 650 constituencies return one MP to the House of Commons. It resulted in a Conservative majority, a massive loss of seats for the Liberal Democrats, and all but three Scottish seats going to the SNP. UKIP won its first seat at a general election. Alliance and Respect each had their representation from the last Parliament wiped out. The UUP won representation after none in the previous Parliament. Notable newcomers to enter the House of Commons in this General Election included Ian Blackford, Liz Saville Roberts, Rebecca Long-Bailey, Angela Rayner, Antoinette Sandbach, Mhairi Black, Oliver Dowden, Chris Matheson, Heidi Allen, Keir Starmer, Stephen Kinnock, Jess Phillips, Ruth Smeeth, Kelly Tolhurst, Tulip Siddiq, and Clive Lewis. During the 2015–17 Parliament, John Bercow was the Speaker, David Cameron and Theresa May served as Prime Minister, and Harriet Harman and Jeremy Corbyn served as Leader of the Opposition. Below is a graphical representation of the House of Commons showing a comparison of party strengths as it was directly after the 2015 general election. This is not a seating plan of the House of Commons, which has five rows of benches on each side, with the government party to the right of the Speaker and opposition parties to the left, but with room for only around two-thirds of MPs to sit at any one time. See here for a full list of changes during the fifty-sixth Parliament. In addition to the parties listed in the table above, the Co-operative Party was also represented in the House of Commons by Labour MPs sitting with the Labour Co-operative designation. The number of these MPs was 24 after the general election, and was 28 at dissolution. The actual government majority is calculated as Conservative MPs less all other parties. This calculation excludes the Speaker, Deputy Speakers (two Labour and one Conservative) and Sinn Féin (who follow a policy of abstentionism). The following table is a list of MPs elected, ordered by constituency. Names of incumbents are listed where they stood for re-election; for details of defeated new candidates and the incumbent who stood down in those cases see individual constituency articles. Torfaen Labour Nick Thomas-Symonds (L) Seat held, incumbent Paul Murphy stood down. ^ a b c d The incumbents for these seats were originally members of political parties before either being suspended or resigning from their respective parties and subsequently sitting as independents for the remainder of the Parliament. After the general election, changes can occur in the composition of the House of Commons. This happens as a result of the election of Deputy Speakers, by-elections, defections, suspensions or removal of whip. After the swearing in of MPs and the elections of the Speaker and the Deputy Speakers, the initial government majority was calculated to be sixteen. Technically, MPs cannot resign. However, they can effectively do so by requesting to be appointed as the Crown Steward and Bailiff of the Manor of Northstead or the Crown Steward and Bailiff of the three Chiltern Hundreds of Stoke, Desborough and Burnham, which vacates their seat. The net outcome of all changes over the course of the Parliament had resulted in two fewer Labour MPs, two fewer SNP MPs, one more Liberal Democrat MP and three more independent MPs. In accordance with a decision taken by the House of Commons on the final day of its sitting in the previous Parliament, the Speaker appointed two members to serve as Temporary Deputy Speakers until the Deputy Speakers had been elected. Directly after the 2015 State Opening of Parliament, the Speaker nominated Sir Roger Gale (Conservative, North Thanet) and George Howarth (Labour, Knowsley) for these positions. The election of Deputy Speakers took place on 3 June 2015. Although Deputy Speakers do not resign from their parties, they cease to vote (except to break ties) and they do not participate in party-political activity until the next election. By-elections are held for seats that become vacant. A by-election was planned to be held in the seat of Manchester Gorton following the death of Sir Gerald Kaufman on 26 February 2017. Following the announcement on 18 April 2017 of a snap general election by Theresa May, it was confirmed that the Cabinet Office would intervene to cancel the by-election, leaving the seat vacant until the general election on 8 June 2017. In some situations, the label under which MPs sit in the House of Commons can change. When this happens, MPs often become independents. Thomson withdrew from the SNP whip on 29 September 2015 after her business became the subject of a police investigation into alleged irregularities regarding property deals. As a result, she then sat as an independent. In line with party rules, upon withdrawing from the whip, her SNP membership was suspended. McGarry withdrew from the SNP whip on 24 November 2015 after being named as under investigation by the police regarding financial discrepancies relating to Women for Independence, a campaign organisation for which she is a founder. As a result, she then sat as an independent. In line with party rules, upon withdrawing from the whip, her SNP membership was suspended. Danczuk was suspended from the Labour Party on 31 December 2015, pending an investigation by the National Executive Committee, after allegations were made that he exchanged explicit messages with a 17-year-old girl. As a result of the suspension, he has been withdrawn from the Labour whip, and then sat as an independent. Shah was suspended from the Labour Party on 27 April 2016 pending an investigation into social media comments which she made, including proposing the relocation of Israel to North America. As a result of the suspension, she was withdrawn from the Labour whip and she sat as an independent, before being reinstated on 5 July 2016. Tomlinson was suspended from the House of Commons from 11 to 12 October 2016 after a vote by MPs on 10 October 2016. This was in accordance with a recommendation by the Privileges Committee after it found that he had committed a contempt by disclosing a confidential draft report by the Public Accounts Committee to an employee of Wonga.com. Carswell left UKIP on 25 March 2017, saying that he had left amicably to focus on local issues as the UK was certain to leave the EU. Former leader Nigel Farage had previously called for Carswell to quit, saying that Carswell was actively working against UKIP. As a result, he then sat as an independent. ^ "General election 2017 officially under way as May meets Queen". BBC News. 3 May 2017. Retrieved 3 May 2017. ^ "Current State of the Parties". www.parliament.uk. Retrieved 9 December 2016. ^ "MPs". UK Parliament. Retrieved 12 May 2015. ^ "MPs at dissolution – 30 March 2015". UK Parliament. Retrieved 12 May 2015. ^ John Bercow, Speaker (27 May 2015). "Deputy speakers". Parliamentary Debates (Hansard). 596. House of Commons. col. 30. ^ John Bercow, Speaker (3 June 2015). "Devolution and Growth across Britain". Parliamentary Debates (Hansard). 596. House of Commons. col. 633. ^ "Tributes paid to veteran Labour MP Michael Meacher". BBC News. 21 October 2015. Retrieved 21 October 2015. ^ Chris Johnston (5 February 2016). "Labour MP Harry Harpham dies of cancer aged 61". The Guardian. Retrieved 6 February 2016. ^ a b Peter Edwards (24 March 2016). "Labour confirms Sheffield and Ogmore by-elections for May 5". LabourList. Retrieved 25 March 2016. ^ "Gill Furniss wins Sheffield by-election for Labour". BBC News. 6 May 2016. Retrieved 6 May 2016. ^ "Huw Irranca-Davies resigns as MP for Ogmore". UK Parliament. 24 March 2016. Retrieved 5 March 2017. ^ "Labour holds in Ogmore by-election with 52% of the vote". BBC News. 6 May 2016. Retrieved 6 May 2016. ^ Tom Marshall (9 May 2016). "Tooting by-election triggered after Sadiq Khan stands down as MP". Evening Standard. Retrieved 11 May 2016. ^ "Tooting by-election will be held on June 16". Wandsworth Council. 11 May 2016. Retrieved 12 May 2016. ^ "Labour's Rosena Allin-Khan wins Tooting by-election". BBC News. 17 June 2016. Retrieved 17 June 2016. ^ a b "Batley by-election to be on 20 October". BBC News. 15 September 2016. Retrieved 21 October 2016. ^ a b "Witney by-election: Tory majority slashed in David Cameron's former seat". BBC News. 21 October 2016. Retrieved 21 October 2016. ^ "David Cameron to quit as Conservative MP for Witney". BBC News. 12 September 2016. Retrieved 12 September 2016. ^ a b "Richmond Park by-election: An at-a-glance guide". BBC News. 10 November 2016. Retrieved 12 November 2016. ^ a b "Sleaford by-election candidates line up for Tories and Labour". BBC News. 11 November 2016. Retrieved 12 November 2016. ^ "Manor of Northstead: Jamie Reed". HM Treasury. 23 January 2017. Retrieved 26 January 2017. ^ a b "Labour announce date for by-elections to replace Tristram Hunt and Jamie Reed". BBC News. 20 January 2017. Retrieved 20 January 2017. ^ "Three Hundreds of Chiltern: Tristram Hunt". HM Treasury. 23 January 2017. Retrieved 26 January 2017. ^ "Manchester Gorton by-election cancellation confirmed". BBC News. 19 April 2017. Retrieved 19 April 2017. ^ "Nicola Sturgeon learned of SNP MP allegations from Sunday newspaper". BBC News. 30 September 2015. Retrieved 30 September 2015. ^ "Natalie McGarry withdraws from SNP whip over campaign fund probe". BBC News. 24 November 2015. Retrieved 25 November 2015. ^ "Labour's Simon Danczuk suspended over 'inappropriate behaviour'". BBC News. 31 December 2015. Retrieved 31 December 2015. ^ "MP Naz Shah suspended from Labour". BBC News. 27 April 2016. Retrieved 27 April 2016. ^ "Labour Party reinstates Bradford West MP Naz Shah". BBC News. 5 July 2016. Retrieved 11 July 2016. ^ "Privileges". Parliamentary Debates (Hansard). 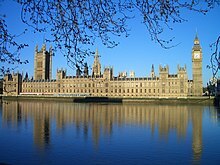 United Kingdom: British House of Commons. 10 October 2016. col. 74. ^ "Justin Tomlinson MP suspended over Wonga report leak". BBC News. 10 October 2016. Retrieved 21 October 2016. ^ "Job done – thank UKIP!". Talk Carswell. 25 March 2017. Retrieved 25 March 2017. ^ "Douglas Carswell quitting UKIP". BBC News. 25 March 2017. Retrieved 25 March 2017.